I have fond memories of the Raincity Grill as it was a Vancouver staple in English Bay since 1992. Viv and I enjoyed several meals in the past as well as her birthday brunch where we took over 1/3 of the restaurant. But that was then and this is now. The sad reality is that the location needed something brighter and more dynamic. 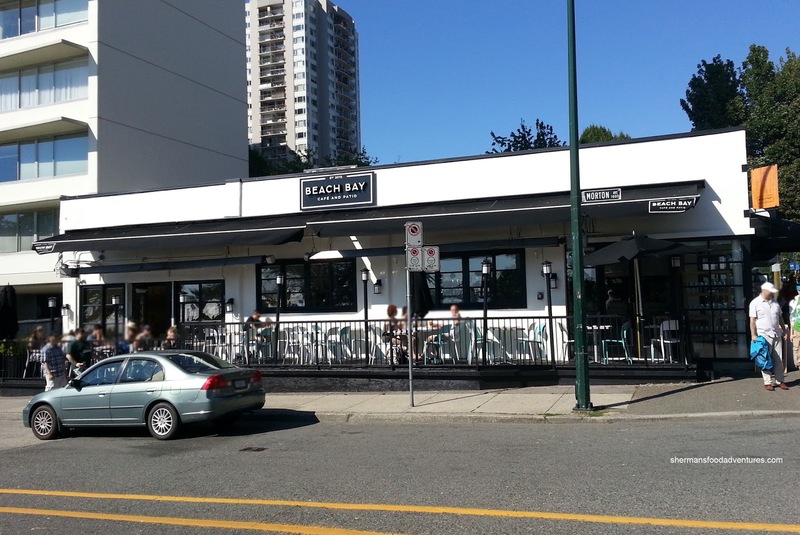 Enter Beach Bay Cafe with plenty of natural light adorning the clean interior. This is a total 180 from the dark 80's look of Raincity. I was able to try out the place with Sean (as his +1 for the Westend BIA Instagram takeover) on a nice Summer day which really helped highlight the awesome location right at English Bay. 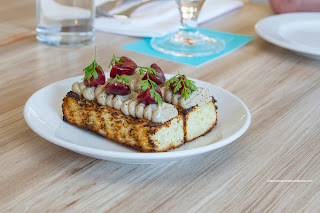 We began with the Chicken Liver Mousse on Toast. Smoky and charred, the toast was the first thing that hit my palate, but then the creamy and sweet mousse kicked in with the benefit of mildly tart cherries and a kiss from the chervil. I would've liked the toast to be slightly thinner though. 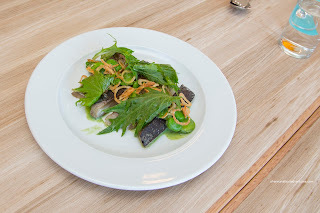 Next up was the lightly pickled Mackerel with fava beans, mustard greens, crispy shallots and mint dressing. I found the fish to be buttery and nicely charred. It was pickled just enough with a sweet acidity that was accented by a sprinkle of sea salt. The crispy shallots added an aromatic crunch, but I wasn't sure of the fava beans because the chalkiness didn't do anything for the dish. When Sean mentioned we should really try the Summer Vegetable Salad, I thought he had lost his mind. Well, I guess my mind was permanently lost (if it weren't already) because this was a fine salad. 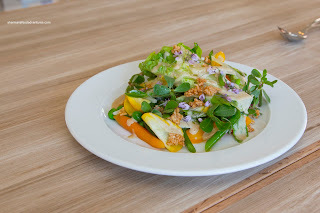 Consisting of snap peas, radish, carrots, yellow zucchini and lettuce with an oyster emulsion, everything was fresh and vibrant to the eye as well as to the palate. 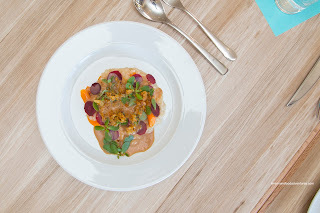 The sweet crunch of the veggies was accented well by the silky and subtle emulsion. There was an appealing crunch from the crisps where there was a lingering bacon aftertaste. On the topic of aftertaste, the Risotto exhibited a strong vinegar taste from start to finish. Somehow, there was too much cider vinegar in the crab custard which essentially ruined the dish. Too bad really as the rest of it was quite good including the firm Carolina gold rice and crispy chicken skin. Onto the mains, we shared the Grilled Pork Chop with charred kohlrabi, English peas and blackberry sauce. The chop was well-executed being just done with a touch of pink. 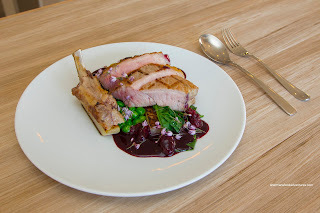 Rich and sweet, the blackberry sauce did go well with the moist pork, but maybe some salt or more wine finish would've provided more balance. 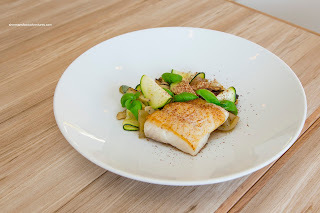 The next dish, Black Cod a la Plancha with green tomatoes, grilled cabbage and zucchini, was my favourite of the meal. 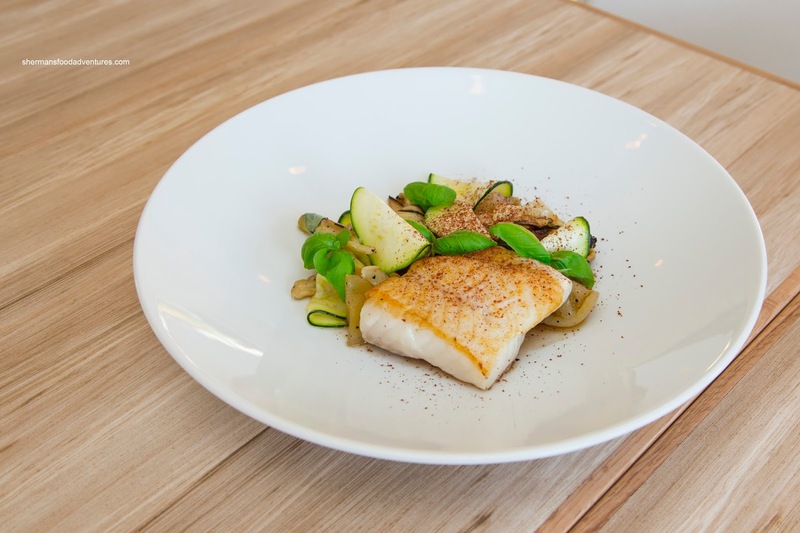 As much as black cod is a forgiving protein, this one was masterfully prepared. It was buttery and flaky with a delicately crisp exterior. In addition to being well-seasoned, the fish was the beneficiary of acidity provided by the pickled green tomatoes and the tartness from the sprinkle of sumac. For dessert, we tried both the Pistachio Cake and Lime Tequila Semifreddo. Too bad the piece of pistachio cake was so small because it was fantastic. 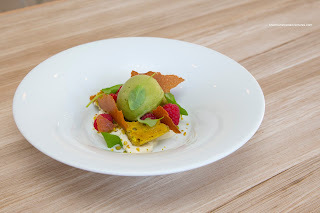 Aromatic, lightly sweet and balanced in texture (not too soft, not too firm), it was complimented by the grassy sorrel sorbet on top. Raspberries and white chocolate namelaka rounded out the dish. As for the semifreddo, it was smooth and soft, yet it retained its shape to the very last piece. It was mildly sweet with enough tequila for effect but not overwhelming. I personally would've liked to see more lime though. 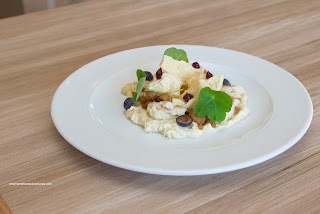 Other items on the plate included fig leaf cream, angel food cake, graham crumble and blueberries. These 2 refreshing and light desserts ended off a relatively good meal. Sure, the risotto was unfortunate, but 7 out of 8 is a good batting average.